Camaraderie Cellars, one of our Washington State Wineries on the Olympic Peninsula, has found the perfect cookie to pair with a glass of Washington State Wine. Read on for the recipe, and hope that they’ll be served during the upcoming Harvest Wine Tour, November 13 and 14, 21010. 4. 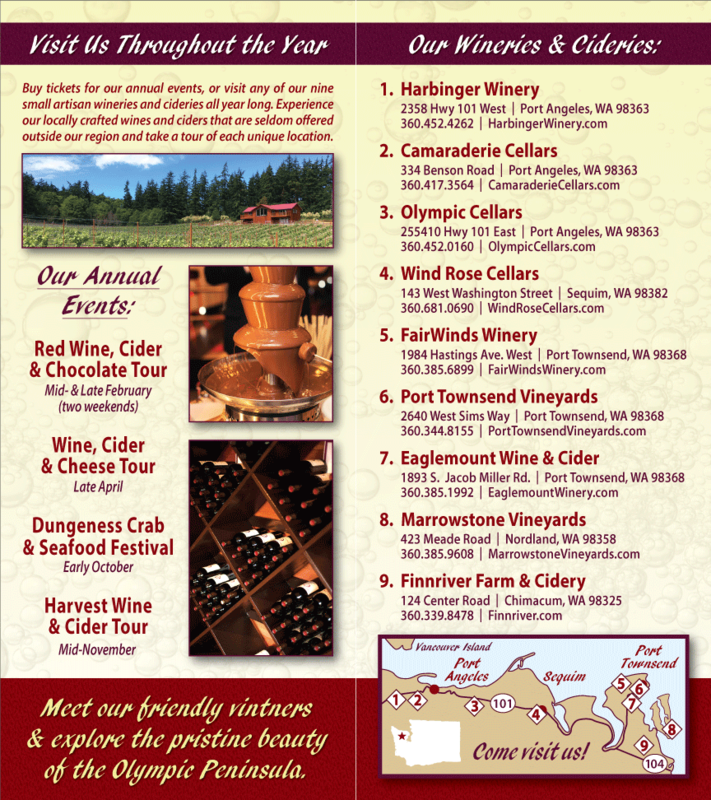 Enjoy with a glass of your favorite Washington State Wine. Yield: Makes about 4 dozen cookies. This final post in our holiday recipe series features two delicious hors d’oeuvres and wine pairings perfect for New Years Eve entertaining, and a Monte Cristo Sandwich that’s sure to be a hit on your New Year’s Day brunch menu. The first recipe was provided by Winemaker Richard Sorensen of Sorensen Cellars. This recipe is a collaboration between myself, my wife Rita and Dacia Morrisonbuck of Cuisine Med in Port Townsend. We introduced my Sorensen 2007 Viognier during Passport Weekend this year, and wanted a bite of something to go with the wine. I feel that there are nuances of apricot, almond and peach in the wine and I wanted to pull these together with a light appetizer. This is what we came up with. In a food processor blend cheeses until smooth, then drizzle in honey (approx. 1 teaspoon or to taste). Fold in almonds, (reserving 1 Tablespoon for garnish), and apricots. Mold into a mound-press or small attractive bowl. Sliver a few apricots on top along with the Tbs. of almonds. Spread on hearty crackers or firm bread. The next recipe comes from Edgar Burks, wine specialist at Harbinger Winery. This recipe comes from my friend and cooking mentor, Chef Giuseppe Brucia. It is modified slightly from the original. Serves 6 as appetizers or 4 as main course. Pair with Harbinger Dynamo White, Chardonnay, or Viognier. *Prepare simple shrimp stock by simmering shrimp shells in ¾ cup of water until reduced to ½ cup. Pour through strainer and discard shells. 1. Prepare the green onions by removing the top 1/3 of the green tops. Discard or save for other use. Cut the remaining onion in half so that there is a white portion and a green portion. 2. Dry the shrimp with paper towels. In a large skillet over high heat, add 1 Tbsp. of butter with olive oil. When hot add the shrimp and brown each side for 40 seconds. 3. Add bell pepper, garlic, both green onion halves and mushrooms. Cook, stirring constantly, for 45 seconds. 4. Add Cognac and flame (use caution). 5. Add Harbinger Dynamo White and shrimp stock. Bring to boil over high heat. 6. Add the heavy cream, stir and let the sauce thicken. 7. Remove shrimp, placing 4 shrimp on each hot plate. 8. Return sauce to heat to further thicken for a few seconds. 9. Add Worcestershire Sauce, Tabasco and lemon juice. 10. Turn off the heat and white stirring add last 1 Tbsp. of butter, salt and pepper to taste. 11. Pour sauce over shrimp. Sprinkle with parsley. Variations: Make sauce alone and serve over halibut or ling cod. The last recipe is from Sharon Adams of Black Diamond Winery. Enjoy! One of my favorite parings is Cranberry Wine and a Monte Cristo Sandwich. It’s great for brunch! Yield: One Serving. Serve with chilled Black Diamond Cranberry Wine. 1 egg beaten with 1 tablespoon cream or half and half. Heat pan over medium hi heat. Oil pan with favorite oil. Dip one side of bread in egg mixture place in pan. Place slice of turkey and cheese on bread, and cover with second piece of bread dipped in egg mixture (only dip one side). Cook as you would French Toast, turning when first side is golden brown. Cook second side until golden brown and cheese is melted. Put on warmed plate and sprinkle with powdered sugar. Optional – put your favorite jam or cranberry sauce on top. We hope you’ll have the opportunity to enjoy these tried and true recipes and suggested wine pairings with family and friends this season. If so, please share your “culinary experience” with us! We welcome your comments. Soup is my comfort food, particularly when enjoyed with a nice, warm, buttered whole grain roll and a glass of our Gold Medal 2005 Syrah or “Gracefully Aging Red,” our 2006 Zinfandel. After a long day at the winery, I appreciate a tasty meal that’s fast and easy to prepare. I don’t go into “food stress” with this 15-year-old recipe I found while living in Dallas. Combine first 8 ingredients in large saucepan; bring to a boil. Cover, reduce heat and simmer 10 minutes or until pasta is done, stirring occasionally. Stir in cheese; ladle into bowls. For more interesting flavor, try adding some basil pesto to taste and stir in. Makes 9, one-cup servings. This recipe, provided by Olympic Cellars’ Winemaker Benoit Murat, is ideal for cold weather and easy to prepare. Pair with Olympic Cellars’ Gold Medal 2005 Syrah. Chop onion, celery and carrots and set aside in a bowl. Sear bacon in a large stew pot. Salt and pepper stew meat, and add half of meat to pot. Brown on all sides, and remove from pot. Add remaining half of beef to pot and brown, adding oil if necessary. Next, combine all browned meat in the pot and add flour, stirring frequently. Remove meat, place in a bowl and set aside. Place chopped vegetables in pot and stir-fry for a few minutes. Return meat to pot, adding minced garlic, sliced mushrooms. Add beef broth and red wine, completely covering contents. Wine can be good stuff so you can drink a part of it before, or cheap stuff for cooking. You will need about 2 bottles. Add all herbs and simmer, uncovered, for 2 or 3 hours. Serve as a soup or over pasta, rice or potatoes. You can add the potatoes 20 minutes before serving and allow them to cook in the stew. Lately as we travel it seems that almost every town a person visits looks the same. Drive down the main shopping area and you’re likely to see the same restaurant chains, the same clothing stores, and the same home improvement stores. Nothing seems unique anymore! Uniqueness is being lost. And many large commercial wineries are contributing to its demise by providing remarkably similar experiences for their customers. Wine visitors can have a difficult time identifying what makes one large winery unique from another. Wine making is steeped with amazing traditions and values that many times customers can experience only when they visit the small distinctive family owned wineries. Nearly all wineries will state that it is their wines that make them unique. While this is true to some extent, in visiting the wineries of the Olympic Peninsula you have the opportunity to meet the people behind the wines and experience the passion that the winemakers have for their creations. Experience first hand what it is about wines that fascinates and intrigues people. So come visit us this time of year as the wineries prepare to swing into the harvest season and immerse your self in the joy of experiencing the differences that makes wine tasting so enjoyable.